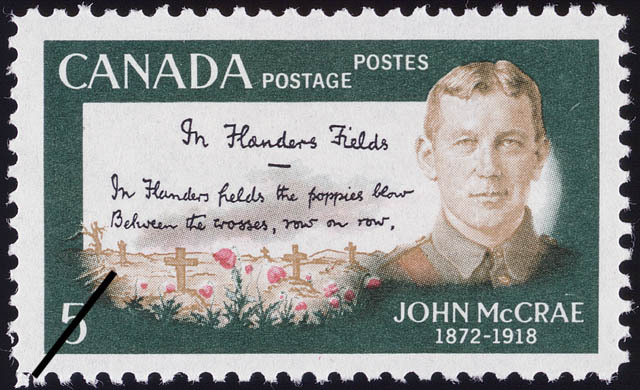 The value of a John McCrae, 1872-1918, In Flanders Field - 5 cents 1968 stamp depends on several factors such as quality and wear, supply and demand, rarity, finish and more. Values in the section are based on the market, trends, auctions and recognized books, publications and catalogs. This section also includes information on errors and varieties and characteristics. It is appropriate that the Canada Post Office also commemorates the 50th Anniversary of the year in which Lieut.-Col. John McCrae died. A poet and medical doctor, McCrae achieved fame with In Flanders Fields. Probably the most frequently quoted poem written by a Canadian. Born at Guelph, Ontario, in 1872, John McCrae entered the medical profession serving in the Toronto General Hospital then at Johns Hopkins, Baltimore. He volunteered for the South African War and was commissioned a Lieutenant in the Royal Canadian Artillery. Returning from overseas he spent some 14 years in medical practice, writing and lecturing at McGill University in Montreal. In 1915, at the age of 43, he was Major McCrae and brigade surgeon of the 1st Brigade Canadian Field Artillery in France; on May 3rd of the same year he composed the memorable and poignant In Flanders Fields. Rarely was a lasting literary work composed under such adverse and dramatic circumstances, the locale was an artillery dug-out by the Yser Canal during the 2nd Battle of Ypres. The original manuscript, penned on foolscap paper, now in the Public Archives of Canada, differs in minor ways from a more generally known version. Our stamp reproduces the authors own handwriting on the original manuscript, the poem commencing In Flanders Fields the poppies blow. In a subsequent signed copy, presented by McCrae to the Royal Victoria Hospital, Montreal, the word blow has been changed to grow; there remains a question whether the alteration had been intentional. A Major-General wrote: "This poem was literally born of fire and blood". John McCrae succombed to pneumonia at Boulogne, France, on the January 28, 1918, shortly after his promotion to Lieut.-Col. He had not lived to embark upon a new role as commander of the First General Hospital and consulting physician to all British Armies in the field.